In this video, we’ll cover how to develop websites using just the computer you have already. Now, if you just want a website and don’t want to be a web developer, don’t mess with learning all of this, get a site from squarespace.com and use squarespace plugins from http://thecustomsquare.com to make your site unique. 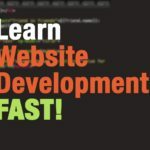 Learn how to develop your own websites using the computer you already have. The basics of web development is the html file, which is centered around html tags. In this first lesson, we’ll cover the basic html tags and how to use them to build a web page. Once you learn HTML, you can use CSS to add style to your pages and JavasScript to add animation and fun features. How to Create a Website from Scratch in Under 10 Minutes!